Richard Faulkerson Jr., now more popular as the actor Alden Richards has achieved more than what a regular 20-year old boy can do. After getting the public's attention as part of the GMA's youth-oriented show Tween Hearts and has raked in high ratings for the kapuso network via his first lead TV series One True Love, Alden won Amazing Male Newcomer in the 2011 Yahoo OMG Awards and Best New Actor at the 2011 Golden Screen Awards for TV. Alden's road to ultimate stardom will become brighter as he leads another GMA 7 drama series Mundo Mo'y Akin and is set to appear alongside Robin Padilla in an entry at the upcoming Metro Manila Film Festival 10,000 Hours. While spending post- Father's Day with his dad, Richard Sr., at the SM North Edsa Bowling Center last Tuesday, June 18, Alden revealed to a select team of media men and bloggers that he is getting used to being busy and remains to be thankful for all the big breaks he is receiving. In fact, he himself proactively told his dad that he would concentrate on his work first even if the latter OK'd on him entering a relationship. "No, I'm not against it. OK lang para sa akin", Richard Sr. said were Alden immediately interrupted, "Ayoko pa din Dad. Career muna..." "Sa dami ng nangyayari sa career ko, (relationship) is not really in my priority. Steady lang muna. Wala talagang time eh. I'm sure it's gonna be a destruction", Alden explained further. For his part, Alden gave a go signal to is dad to date once again. His father is a widower and Alden posted just one condition: "Basta 'wag lang niya pabayaan kaming magkakapatid." This, he said, includes doing the things they do to bond often: hitting the gym, bowling and going to the mall. "This is one of the things I'd love to do during my free time, bonding with my dad", the young actor said, closing the interview and tapping his dad's shoulder to begin an exciting bowling match. 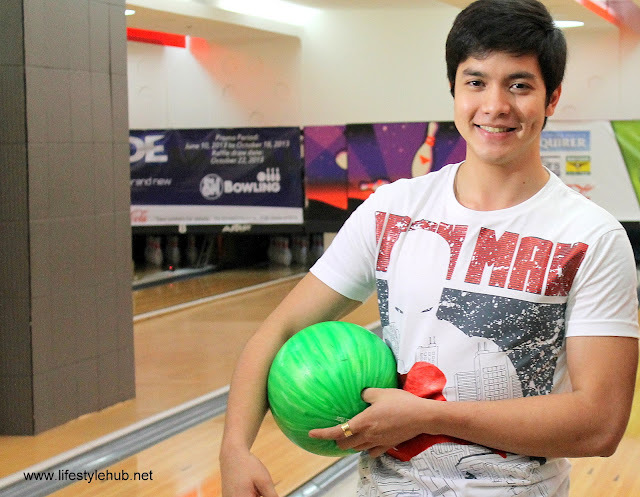 Here's a 45-minute clip of Alden's Father's Day bowling bonding with dad.